Mort had an extremely eventful weekend, to say the least. In between gallery appearances in Gettysburg and Winchester, he attended “Party for Paws”, a fundraising event benefitting the Humane Society of Warren County. 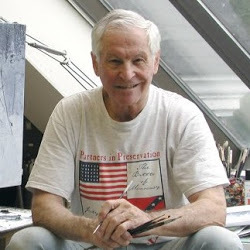 Mort generously donated his time and talent for the affair’s auction by agreeing to do an original sketch of the highest bidders favorite pet. Prior to the auction Mort was, somewhat unexpectedly, asked to speak. 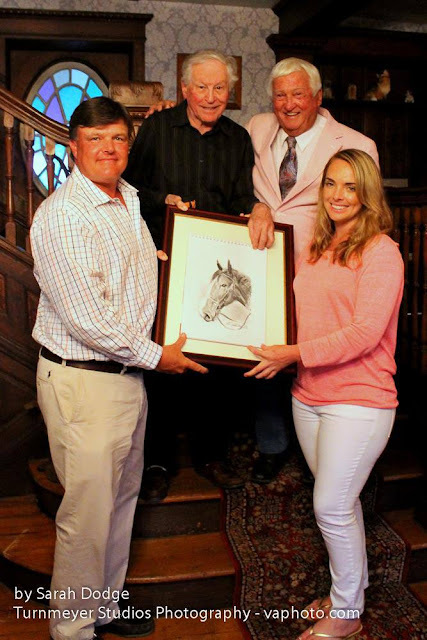 Larry LeHew and his son Jeff graciously hosted the affair at the family’s stately and historical home Bel Air, which overlooks Front Royal, VA. This is the same house seen in Mort’s painting The Autograph Seekers of Bel Air. This photo is of Mort, Larry LeHew, and the winning bidders with their prized new sketch.